For simplicity, I will assume that the manufacture of a Prius is essentially the same process as that of a non-hybrid ICE, plus the extra environmental impact required for the hybrid components (battery, electric motor). Can anyone tell me the amount of carbon emissions attributable specifically to the manufacture of the hybrid components? I can then calculate how many gallons of gasoline would need to be burned to emit the same amount of carbon as is involved in the manufacture. It then becomes simple to calculate what I really want to know, which is the breakeven point at which the Prius becomes a net positive from a carbon perspective compared to whatever other car. This breakeven point will, of course, vary a bit depending on the MPG of the other car. I see from some Googling that there is a good deal of information (and misinformation) related to this, although I have yet to find quite the concise answer I'm searching for. I also know that measuring just carbon emissions oversimplifies things a little, as there are other factors at play in the manufacture of the batteries. But it's a reasonably-good starting point. By mile 4,000 at the latest, total emissions from a hybrid Prius beat emissions from a standard Corolla. Vehicle construction emissions, excluding the traction battery, are equal for all powertrains. Maintenance and disposal (end of life) emissions of all powertrains are equal. Is ignoring the powertrain a valid assumption? The assumption that the powertrain construction for all vehicle types has roughly the same CO2 emissions is based on a comparison of battery electric vehicles (BEVs) and ICEVs from "Contribution of Li-Ion Batteries to the Environmental Impact of Electric Vehicles". We can assume that a HEV powertrain would also be roughly the same, as from a component standpoint it splits the difference between the two. The best data I could find on CO2eq emissions from EV battery production comes from: "Life Cycle Environmental Assessment of Lithium-Ion and Nickel Metal Hydride Batteries for Plug-In Hybrid and Battery Electric Vehicles". 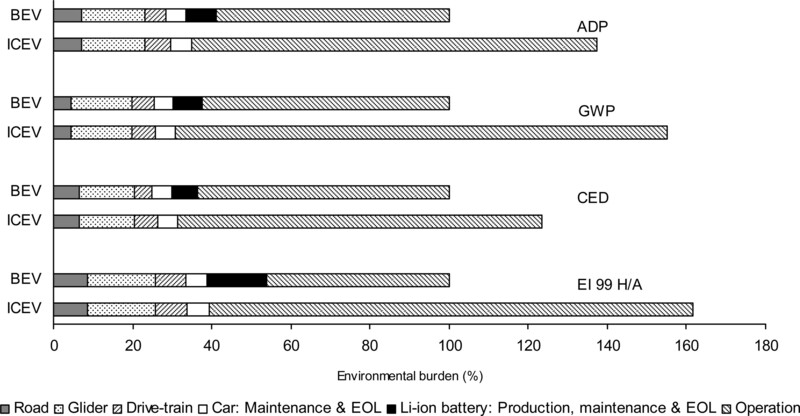 These figures match the range found in the report "Life cycle assessment of lithium-ion batteries for plug-in hybrid electric vehicles -- Critical issues" (when scaled from a 10 kWh PHEV battery). From "Life Cycle Assessment of Greenhouse Gas Emissions from Plug-in Hybrid Vehicles: Implications for Policy" (the values themselves are in the supplementary material). The Toyota Prius HEV comes with either a NiMH or Li-Ion battery bank (from the official spec), with roughly 1.3 kWh capacity (based on a 6.5Ah battery at about 200V - source). How far do you have to drive the Prius before it beats the Corolla? When you drive a Prius off the lot, it has already resulted in emissions of 160 to 460 kg CO2. Per mile, however, it will emit less than a Corolla. So how many miles do you have to drive the Prius before you've emitted less total CO2 than if you'd been driving the Corolla? From FuelEconomy.gov, a new Prius gets 52 mpg, while a new Corolla gets 31 mpg. Let's call this CO2 per mile or cpm. Not the answer you're looking for? Browse other questions tagged carbon-footprint cars life-cycle-analysis manufacturing or ask your own question.